Below is an article which my sister, Rebekah, wrote for my website. Here is the link to the original post: https://pureentertainmentpreservationsociety.wordpress.com/2017/12/.... We would love to have the talents of some of the members of this group. If someone who does not have a blog would like to join, he may send his article to us, and we will publish it on our website. Thank you! Friends! I, Rebekah Brannan, co-founder of PEPS, have had very little to do with the writing of articles on PEPS up until now. My first solo participation was “Ring of Love:” An Original Movie from 1940 by Rebekah Brannan, for the Great Breening Blogathon. 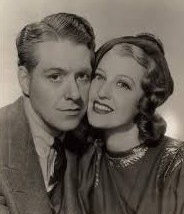 As many of you may have gathered from the subject of my article, I am a great fan of Jeanette MacDonald and Nelson Eddy, the Singing Sweethearts of the Silver Screen. So, for my first major participation in PEPS, I am hosting a blogathon honoring this team, one of the greatest pairings in Hollywood history. It will run from February 12-14, 2018, since, what better time is there to honor the Singing Sweethearts than on Valentine’s Day? Although this grand pair only made eight movies together, they also made many great movies separately, such as Nelson Eddy’s brilliant Let Freedom Ring (1939) and Balalaika (1939), or Jeanette MacDonald’s sparkling Broadway Serenade (1939) and San Francisco (1936). In this blogathon, any fan of these two magnificent nightingales of the Screen can write about one of their glorious pairings, one of the marvelous films they made separately, or an original idea for a movie they could have made together! You may write about any film which features one or both of the Singing Sweethearts, or you may write the outline of a movie which they could have made together. You may also write about a non-film aspect of there careers, such as their opera careers, their participation in World War II, or their radio careers. Because the subject of this blogathon is largely the Singing Sweethearts’ movies together, of which there are only eight, I am putting no limit on duplicates. This will present an interesting collage of contrasting opinions. I must ask that, in this blogathon, all participants discuss only their on-screen romance and relationship. Although I know it is tempting to discuss their personal lives and relationships, I wish this to be an entirely on-screen blogathon. You can discuss their marvelous chemistry, and their excellent interaction to a point. I mainly want to avoid discussion of their alleged affair, since the extent of their relationship is largely debatable. In conclusion, let’s keep this blogathon entirely Code compliant! In conclusion, I hope that everyone of you, our friends and supporters, will be as excited about this as I am and will want to write article honoring this wonderful team! I am extremely appreciative and thankful for all the kind people who participated in the Great Breening Blogathon, as well as those who wanted to but were too busy. I hope that they all will be able to participate in my Singing Sweethearts Blogathon and will enjoy it as much as I will. So, ring the assembly bell and gather in the town square. Here comes the Singing Sweethearts Blogathon! Here are the banners for the blogathon. Please choose one and put it in your article. If you are writing about an original idea for a movie they could have made together, please use this banner, since it features a picture from Farewell to Dreams, a movie they were going to make together which was never completed. We would greatly appreciate it if you would advertise the blogathon on your websites and on social media with these banners.